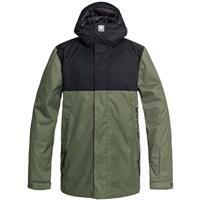 This men's snowboard jacket features a stylish design in a variety of hues so you look as good as you ride. This men's winter jacket is made from a durable fabric blend, complete with water- and weatherproof qualities that help ward off the elements and keep you dry. Taped seams ensure moisture never gets in while underarm venting ensures it gets outs. The ripstop fabric prevents wear and tear so you can rely on this jacket for years to come. A jacket-to-pants connection system ensures your winter apparel stays snugly on your body, keeping everything in place. This men's jacket is also fitted with a variety of pockets including an interior media pocket with cord routing for your phone or music device. Perfect for snowboarding, skiing and casual cold-weather wear, this men's winter jacket is a must-have solution to your winter wardrobe.